This study reported four cases of disseminated non-tuberculous mycobacterial (NTM) infection caused by local puncture, and elaborated the pathway of infection, their clinical manifestations, the process of diagnosis and treatment. The study aimed to improve the clinicians’ recognition on the sterilization of acupuncture, and prevent the iatrogenic infection. Both the 4 cases had a history of local puncture, and diagnosed as disseminated NTM infection. They recovered to a better situation after receiving the anti- NTM infection treatment. Recently, there were few reports about disseminated NTM infection caused by local puncture. The clinical manifestation is not obvious, it usually misdiagnosed as tuberculosis mycobacteria. Thus, it’s necessary to improve the recognition of infection routes and clinical manifestations of NTM, and establish a standard operational disinfection procedure. Puncture, Non-tuberculous mycobacteria, Tuberculosis, Mycobacteria. Except for Mycobacterium tuberculosis complex (including M. tuberculosis, Mycobacterium bovis, Africa mycobacterium) and Mycobacterian leprase, non-tuberculosis mycobacteria (NTM, non-tuberculous mycobacteria) are pathogenic bacteria or conditioned pathogens which can invade cervical lymph nodes, skin, tissues and organs. Disseminated non-tuberculosis mycobacterial disease (disease of disseminated nontuberculous mycobacterria, DDNTM)  is defined in the condition that the bacterium is found in more than two lesions or in blood. Many factors contributed to the occurrence of DDNTM, such as the immunosuppressive conditions, organ transplantation and pulmonary disease . Until now, due to the complicated and nonspecific clinical/histologic manifestations of DDNTM [3-5], it was easily to be misdiagnosed and was rarely reported, the diagnosis and treatment of DDNTM infection was still a challenge. Previous studies found that the patients with anti-TNF therapy had a higher risk of DDNTM [6,7], and females were more likely to be infected than males. The present study described  DDNTM cases who were caused by local puncture, which were little reported. Resort to this study, we aimed to improve the awareness of protection against mycobacterium tuberculosis infection caused by various ways, and also provided some information on the diagnosis, treatment and prevention of DDNTM. Between November 2011 and May 2012, 4 patients suffered from disseminated mycobacterium infections which caused by local acupuncture and treated at The First Affiliated Hospital of Wenzhou Medical University were reported. Written informed consent was obtained from each patient. All of them were treated with acupuncture and local injection of medicine in the same clinic several months ago before they were hospitalized. Their demographic and clinical characteristics were summarized in Table 1. Table 1. The demographic and clinical characteristics of the 4 patients. An otherwise healthy 40-year-old woman, she felt “uncomfortable and painful in waist” and diagnosed as “lumbar disc herniation” 5 months ago before being hospitalized. Her symptoms were relieved after acupuncture and local injection of drugs. A painful mass in the left side of lower waist was noted. MRI showed “abnormal signal in L4- S1 psoas and adjacent subcutaneous soft tissue, infection should be considered”. Positive acid fast bacilli was detected in the smear of pus pumped from mass (Figure 1A), while bacteria and fungi was negative. After admission to orthopedics department, the pus culture revealed “fast-growing mycobacteria”. Then she was received a combined regimen of rifampicin/isoniazid/pyrazinamide/ethambutol (RHZE) therapy and hepatic-protective therapy (utilize the mild proprietary Chinese medicine as a preventive mediation). 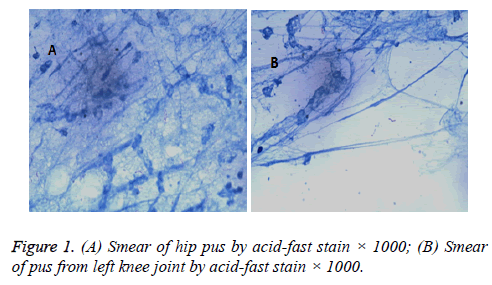 Figure 1 : (A) Smear of hip pus by acid-fast stain × 1000; (B) Smear of pus from left knee joint by acid-fast stain × 1000. Debridement of abscess in left hip was performed, the acid fast stain from pus was detected positive again and also with a positive culture of fast-growing mycobacteria. Pathological examination showed “granulomatous lesion with obvious necrosis in the left hip, tuberculosis should be given more consideration” (Figure 2A). Fever was occurred and the temperature was fluctuated between 37.5 to 38 after operation, the chest CT displayed “diffuse distribution of miliary nodules in both lungs”. Positive result of acid fast stain was detected from joint puncture fluid. Since she was allergic to isoniazide, RZE regimen was used instead of RHZE regimen. However, the wound healing was affected by sustained leaking of pus, then cefoxitin (6 g/d) and clarithromycin (1 g/d) were added. The patient was finally discharged from hospital when the secretions from wound were greatly reduced. “Lesions are absorbed” was proved by chest CT 4 months later. 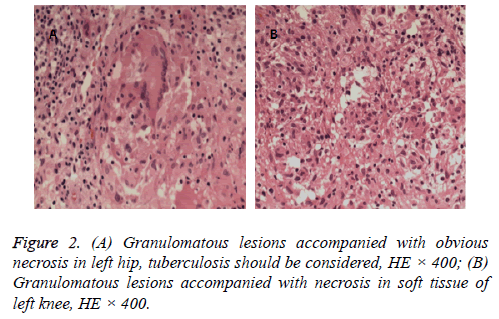 Figure 2: (A) Granulomatous lesions accompanied with obvious necrosis in left hip, tuberculosis should be considered, HE × 400; (B) Granulomatous lesions accompanied with necrosis in soft tissue of left knee, HE × 400. A 53-year-old woman, without history of heart or lung disease. She felt swelling, aching and confined activity in the left knee joint with unexplained reasons for 2.5 months. The puncture and injection of drugs achieved little improvement. “Lesions in and around the left knee joint” was showed by MRI, then she was admitted to orthopedics department with admitting diagnosis of “synovitis and infection in left knee joint”. Slight pressing pain in the left knee joint and confined movements was noted. Her temperature was raised to 39°C on the 2nd day after admission. Ceftriaxone (2.0 g/d) was given to resist infection. Her chest CT scan displayed “miliary nodules are diffused in both lungs”. Miliary tuberculosis could not be ruled out, thus the patient was transferred to respiratory department. However, her temperature still fluctuated at 37-39°C when azithromycin (0.5 g/d) was added. Then it was replaced by the combination injection of isoniazid (0.6 g/d), rifampin (0.6 g/d), ethambutol (0.75 g/d), pyrazinamide (1.5 g/d) and ofloxacin (0.5 g/d), but the regimen showed little effect. After that, positive acid-fast stain was detected in smear of puncture fluid and the culture showed positive in mycobacteria. The patients complained headache and dizziness, so lumbar puncture was given on the 5th day after admission. Cerebrospinal fluid examination revealed protein 853 mg/L, glucose 2.2 mmol/L, chloride 110 ml/L, 9 WBC/μl, 1 RBC/μl, cryptococcus was negative and pressure higher than 400 mmHg. Brain MRI showed “multiple lesions, infectious disease should be considered and tuberculosis is more likely”. T-spot test was positive. Acid fast stain of sputum, smear of fiberoptic bronchoscope-lung-brush and alveolar lavage fluid as well as the detection of Mycobacterium tuberculosis was all negative. As it turned out that both case 1 and 2 received same treatment in the same clinic prior to admission, so the iatrogenic and disseminated infection of NTM had a higher possibility. Treatment regimen was changed into the combination of rifabutin (0.15 g/d), cefoxitin (6.0 g/d), azithromycin (0.5 g/d) and moxifloxacin (0.4 g/d), and her temperature was dropped to normal 0.5 month later. Reexamination of cerebrospinal fluid showed pressure was 200 mmHg, protein 706 mg/L, glucose 2.8 mmol/L, chloride 114 mmol/L. When headache and arthralgia were relieved, she was discharged from hospital. 6 days later, fast-growing mycobacteria was detected in the culture of CSF. Treatment regimen of Isoniazid (0.4 g/d), ethambutol (0.75 g/d), pyrazinamide (1.5 g/d), moxifloxacin (0.4 g/d), rifabutin (0.3 g/d) was continued. A follow-up chest CT showed “obvious absorption of lesions” 4 months after her discharge. A 54-year-old man who was suffered from repeated pain in both knees caused by trauma, he received acupuncture and intracavitary injection of drugs in a local clinic for 2 months but without obvious improvement. Swelling and pain in joints were reoccurred after the end of the course. MRI indicated “injury and swelling of soft tissue in medial collateral ligament and medial retinaculum of left knee joint, marked effusion existed in suprapatellar bursa”, he was diagnosed as arthroedema and treated with articular cavity puncture. The remove of bloody fluid did slight improvement. High fever (40) accompanied with chills, headache, slightly cough and sputum were occurred 1 month prior to admission. Pulmonary CT scan showed “diffuse lesion in both lungs” (Figure 3A). The patient was admitted under the circumstances of persistent fever and suppuration in left knee. 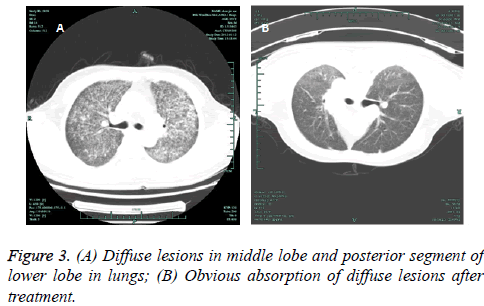 Figure 3: (A) Diffuse lesions in middle lobe and posterior segment of lower lobe in lungs; (B) Obvious absorption of diffuse lesions after treatment. Physical examination revealed that both knees appeared swelling and redness, the left knee joint also with purulent secretion (Figure 4). Linezolid (1.2 g/d) and levofloxacin (0.5 g/d) were used, and yellow pus was cleaned, positive by acid fast stain. T-spot test showed positive. Since he received local acupuncture and injection in the same clinic with previous two patients, coupled with his chest CT scan result, negative in sputum acid-fast stain and positive in synovial fluid acid-fast stain, it could be suspected that the infection was caused by hematogenous dissemination after infection of NTM in knees. Then, he was further treated with azithromycin (0.5 g/d), isoniazid (0.6 g/d, injection 1 day later), ethambutol (1.0 g/d) and cefoxitin (6.0 g/d). Rifabutin (0.3 g/d) were added based on the smear results of paracentesis fluid. His temperature was gradually dropped to normal while sinus was still existed in the right knee. The continued combination treatment of cefoxitin (4.0 g/d), clarithromycin, rifabutin, isoniazid and ethambutol was used. Then he received arthroscopic treatment, obvious absorption of diffuse lesions in both lungs was observed by chest CT (Figure 3B). Figure 4: (A) Local redness and swelling in left knee joint; (B) Local redness and swelling accompanied with ulceration in left knee joint, and fistula was formed. A 73-year-old women, she had suffered from osteoarthritis for more than 10 years and received irregular acupuncture and moxibustion as well as local injection of drugs in a local clinic. The anti-infective therapy was ineffective, and then she was admitted to hospital and diagnosed as "pulmonary infection, tuberculosis, acute respiratory distress syndrome (ARDS), respiratory failure". She was given ventilation assisted by bilevel positive airway pressure and meropenem (2.0 g/d). At the 11th day after admission, she developed fever and swelling, pressing pain in the left knee. Meropenem was replaced by sulperazone based on the culture result of baumanii in sputum, but it was stopped due to the allergic reaction. T-spot result was positive, fiberoptic bronchoscope brushing examination and culture result of bronchial lavage were negative. At the 18th day after admission, her temperature recovered to normal, puncture of the left knee joint was preformed again and the acid fast stain was positive. Then, the combination of isoniazid (0.6 g/d), pyrazinamide (1.5 g/d), ethambutol (0.75 g/d), rifampicin (0.45 g/d) and levofloxacin (0.5 g/d) was given. The patient's symptoms have improved evidently. Chest CT indicated a partial absorption of diffuse lesions in both lungs. Treatment was lasted for 19 months with HRZE regimen and levofloxacin (0.5 g/d) (Figure 4). Though more attentions were paid to NTM infection, its diagnosis and treatment were still difficult . NTM infection mainly occurred in lungs and lymph nodes, rarely in soft tissues, bones, joints and skin . It was pathogenic to human body regardless the status of immune system . Water, soil and aerosols were the primary routes of NTM infection, and there were multiple transmission routes. Chronic respiratory tract infection commonly occurred by M. abscessus, M. avium complex, M. kansasii, M. simiae, etc, meanwhile the traumatic and iatrogenic infection were usually occurred by M. fortuitum, M. neoaurum, etc . Both the 4 patients had a medical history of local skin puncture and received pre-hospital treatment in the same clinic. It could be speculated that the unqualified sterilization before puncture might be the source of NTM infection and contribute to the progression of DDNTM. As there were few studies reported the outbreaks of NTM caused by acupuncture, this study will arouse the concerns of clinicians on the sterilization of acupuncture. For patients who were suffered from NTM infection, their symptoms were inconspicuous or un-obvious, and often companied with chronic cough, sputum even hemoptysis. 30%-50% patients had low fever, night sweats and weight loss which the symptoms were similar with that of tuberculosis infection. Take the low sensitivity and specificity of NTM clinical symptoms into consideration, their medical history and medical image reports were essential for the diagnosis of NTM infection. From this report, the patients mentioned above had the following characteristics, (i) all of them were treated with local puncture and intracavitary injection in the same local clinic during the same time period; (ii) all of them suffered from fever, inflamed hot pain and abscess in skin, soft tissue, muscle or joint, and conventional antibiotic therapy obtained a poor effect; (iii) diffuse lesions in lungs were observed. Miliary nodules existed in 3 cases, the other one was diagnosed as diffuse ground-glass opacity, her manifestations including bronchiectasis with multiple nodules and "tree-in-bud" in ligule or middle lobe, as well as cavity-like changes and isolated nodular shadows; (iv) both of them had abscess and partial necrosis in the position of local puncture and joint, their pathological results revealed caseous necrosis and granulomalike changes (Figure 2); (v) T-spot tests were positive; (vi) Acid-fast bacilli (1-3 +); (vii) positive in fast-growing mycobacteria for the secretions of injury site. The antituberculous therapy was used as the first-line treatment, but the effect was unsatisfactory, and their temperatures were stayed high. After the diagnosis of Case 1, more attentions were paid to the medical record collections and epidemiological characteristics of Case 2-4. Their situations were greatly improved when the treatment was changed and aimed at NTM infection. The following performances and clues were helpful in their diagnosis, (i) acid-fast stain assay of secretion and sputum was positive, the clinical manifestations were different from pulmonary tuberculosis; (ii) the shape of acid-fast bacillus might help to differentiate NTM from other mycobacterium tuberculosis after culturing, bead type or curved and short rodlike shaped were common in the former (Figure 1); (iii) the fast growing of NTM was different from the complex of mycobacterium tuberculosis; (iv) delayed healing of injury in soft tissue or surgical postoperative wound for a long time without definite reasons. There were no effective and specific drugs to resist NTM infection currently. Many NTM had natural resistance to firstline anti-tuberculosis drugs and the resistance rate was up to 100% . For most patients suffered from pulmonary disease caused by Mycobacterium avium-intracellulare complex with nodules or bronchiectasis, clarithromycin 1000 mg/kg or azithromycin 500 mg/kg or the combination of rifampicin 600 mg/kg and ethambutol 25 mg/kg 3 times a week was recommended. For pulmonary disease caused by Kansas mycobacterium, isoniazid 300 mg·kg-1·d-1, rifampicin 600 mg·kg-1·d-1 combined with ethambutol 15 mg·kg-1·d-1 was recommended until sputum culture converted for 1 year. The therapy for non-pulmonary disease caused by fast-growing mycobacteria (including M. Abscessus and M. chelonae) should base on the sensitive test in vitro. Surgical debridement should be performed as soon as possible , it gained better effect than simple medication. In the absence of effective treatment to NTM, early surgical intervention was necessary if local abscess or dead space was occurred . NTM infection has been reported in cosmetic surgery and folk therapy previously . Disseminated NTM infection caused by local puncture in a patient without immunodeficiency was little reported . The clinical manifestation of NTM infection is atypical, it usually misdiagnosed as tuberculosis mycobacteria [6,16]. In this study, relaxed disinfection during the operation caused the iatrogenic infection and further led to the serious systemic dissemination, as well as persistent refractory, which brought great pain and economic burden to patients. Strict disinfection and standard operating procedures should be paid great attentions in the process of clinical diagnosis and treatment, health authorities should strengthen management and hospitals should prevent the iatrogenic infection of NTM. Brownelliott BA, Griffith DE, Jr WR. Diagnosis of nontuberculous mycobacterial infections. Clin Lab Med 2013; 34: 857-864. Mori S, Tokuda H, Sakai F, Johkoh T, Mimori A, Nishimoto N, Tasaka S, Hatta K, Matsushima H, Kaise S, Kaneko A, Makino S, Minota S, Yamada T, Akagawa S, Kurashima A. Radiological features and therapeutic responses of pulmonary nontuberculous mycobacterial disease in rheumatoid arthritis patients receiving biological agents: a retrospective multicenter study in Japan. Mod Rheumatol 2012; 22: 727–737. Albayrak N, Simsek H, Sezen F, Arslantürk A, Tarhan G, Ceyhan I. Evaluation of the distribution of non-tuberculous mycobacteria strains isolated in National Tuberculosis Reference Laboratory in 2009-2010, Turkey]. Mikrobiyoloji Bülteni 2012; 46: 560-567. Shu CC, Wang JT, Wang JY, Yu CJ, Lee LN. Mycobacterial peritonitis: difference between non-tuberculous mycobacteria and Mycobacterium tuberculosis. Clin Microbiol & Infect 2011; 18: 246-252. Kim WY, Jang SJ, Ok T, Kim GU, Park HS, Leem J, Kang BH, Park SJ, Oh DK, Kang BJ, Lee BY, Ji WJ, Shim TS. Disseminated Mycobacterium intracellulare Infection in an Immunocompetent Host. Tuberc Respir Dis 2012; 72: 452-456. Winthrop KL, Yamashita S, Beekmann SE and Polgreen PM. Mycobacterial and Other Serious Infections in Patients Receiving Anti-Tumor Necrosis Factor and Other Newly Approved Biologic Therapies: Case Finding through the Emerging Infections Network. Clin Infect Dis 2008; 46: 1738-1740. Czaja CA, Merkel PA, Chan ED, Lenz LL, Wolf ML, Alam R, Frankel SK, Fischer A, Gogate S, Perez-Velez CM, Knight V. Rituximab as successful adjunct treatment in a patient with disseminated nontuberculous mycobacterial infection due to acquired anti-interferon-? autoantibody. Clin Infect Dis 2014; 58: e115-e118. Griffith DE, Aksamit TR. Therapy of refractory nontuberculous mycobacterial lung disease. Curr Opin Infect Dis 2012; 25: 218-227. Chan ED, Iseman MD. Underlying host risk factors for nontuberculous mycobacterial lung disease. Semin Respir Crit Care Med 2013; 34: 110-123. Wallacejr RJ. Infections Due to Nontuberculous Mycobacteria Other than Mycobacterium avium-intracellulare. Indian J Med Res 2004; 290-304. Brownelliott BA, Nash KA, Wallace RJ. Antimicrobial Susceptibility Testing, Drug Resistance Mechanisms, and Therapy of Infections with Nontuberculous Mycobacteria. Clin Microbiol Rev 2012; 25: 545-582. Fujita Y, Ishii S, Hirano S, Takeda Y, Sugiyama H and Kobayashi N. A case of lung cancer complicated with active non-tuberculous mycobacterium (NTM) infection successfully treated with anti-cancer agents and anti-NTM agents. Nihon Kokyuki Gakkai zasshi 2011; 49: 855-860. Griffith DE, Aksamit T, Brown-Elliott BA, Catanzaro A, Daley C, Gordin F, Holland SM, Horsburgh R, Huitt G, Iademarco MF, Iseman M, Olivier K, Ruoss S, von Reyn CF, Wallace RJ Jr, Winthrop K. An official ATS/IDSA statement: diagnosis, treatment, and prevention of nontuberculous mycobacterial diseases. Am J Respir Crit Care Med 2007; 175: 367-416. Hsiao CH, Cheng A, Huang YT, Liao CH, Hsueh PR. Clinical and pathological characteristics of mycobacterial tenosynovitis and arthritis. Infection 2013; 41: 457-464. Hofmann VM, Khan M, Olze H, Krüger R, Pudszuhn A. [Surgical treatment of children with nontuberculous mycobacteria cervical lymphadenitis]. HNO 2014; 62: 570-574. Supply P, Allix C, Lesjean S, Cardoso-Oelemann M, Rüsch-Gerdes S, Willery E, Savine E, de Haas P, van Deutekom H, Roring S, Bifani P, Kurepina N, Kreiswirth B, Sola C, Rastogi N, Vatin V, Gutierrez MC, Fauville M, Niemann S, Skuce R, Kremer K, Locht C, van Soolingen D. Proposal for Standardization of Optimized Mycobacterial Interspersed Repetitive Unit-Variable-Number Tandem Repeat Typing of Mycobacterium tuberculosis. J Clin Microbiol 2006; 44: 4498-4510.